Colombia has dismissed speculation regarding a puzzling memo from John Bolton, which mentioned 5,000 US troops being sent to the Latin American nation, affirming that it will rely on politics and diplomacy in the Venezuela crisis. Colombian Foreign Minister Carlos Holmes said he is unaware of the “importance and reason” behind John Bolton’s memo, noting that his country will only act “politically and diplomatically” in dealing with Venezuela. The South American nation shares a 2,200km land border with Venezuela and has sided with the US in piling pressure on Venezuelan President Nicolas Maduro’s government. Recently, Bogota backed Juan Guaido, the opposition leader who proclaimed himself to be the interim president of Venezuela. 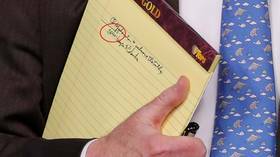 The tight-lipped remark came in response to news from the White House on Monday, when US National Security Advisor John Bolton was spotted holding up a yellow legal notebook during a press briefing on Venezuela.